From 1946 to 1968, Ford offered the Mercury M-Series pickup trucks that literally the F-Series lineup of the day. Only offered in Canada, the M-Series trucks are rare collector's items now, but depending on which car shows you attend in Canada, you may still see the big Mercs still on the road. If you want to know more about the M-Series' history and the various models offered, we found this informative piece at Autonet.ca by Glen Woodcock. We also found this front-view spotter's guide to help with identification issues. You'll note the guide goes to 1972 because it took a few years to sell off the remaining inventory once the Oakville Assembly Plant shut down. I would love to have a Mercury pickup. I could park it along side my 67 Mercury Cougar. Very cool. my dream truck is a 55 merc, i will probably have to settle for a 55 ford as the merc's are either hard to find or expensive. Canadians didnt have Plymouth badged trucks as Americans did,they were called Fargo. We still had Dodge trucks,Fargo's were rare and sold at Chrysler Plymouth dealers,still some of those dealers sold Dodge trucks as well.. In the 60's-70's the Meteor was a Mercury with grill,interior tail light changes,still had Mercury again just a bonus. The Beaumont was a version of the Chevelle in the 60's and we still had the Chevelle and we had the Pontiac GTO again a bonus car for Canadians ,also we had a Pontiac Canso,a version of the Nova..we still had the Nova !! The 1950's Dodge Mayfair was a version of the Plymouth Plaza with a Dodge front,again a bonus car for Canadians we still had the other Plymouth and Dodge models that were the same as the U.S. The 65-66 Dodge Polara/Monaco had a Plymouth Fury dash in Canada,though some American versions sneaked in,also the 1966 Chrysler 300 had 2 models in Canada the 300 had the Windsor (Newport in U.S and in 1967 in Canada) rear tail lights and window,the 300 Sport had the American version 300 wrap around rear tail lights and different rear window ! A duel 4 barrel was an option,wicked fast,quick,powerful,beast !! I am a car collector and know a whole bunch about these cars,even people in Canada get confused with body/trim/interior changes. i had forgot about the canso, full name was the acadian canso which i believe was a sport version and by Pontiac? correct me if im wrong here, i liked it better than the nova version. didnt know that about the dodge trucks though, I have seen fargo vans and trucks around but never questioned what they were. Should of mentioned the Pontiac Acadian was a version of the Nova ,the Acadian Canso Sport Deluxe was a version of the Nova S.S .In the mid 70's-late 80's the Acadian turned into a version of the Chevette,yep we still had the Chevette also ! We also had a Meteor Ranchero it was a version of the Ford Ranchero,again trim,grill changes we still had both just a bonus for us. That list has alot of errors...we always had a Mercury Grand Marquis until end of production last year..We had Mercury Cougars,Milan ect...Mercury wasnt killed off in Canada in 1999 ! The Saratoga was not a replacement for the non letter Chrysler 300's,alot of confusion about Canadian cars but that list has errors. They were not just offered in Canada. My neighbor in Bradford Pa. owned one and he bought it new at the local Ford dealership. They were just as unreliable as the Ford pickup. yeah i noticed some errors too, but thought was an interesting thing to share, curious what some of the mexican or brazilian etc names are, i think F150's are called lobo or something like that in Mexico. The mustang when i came out in 65 was renamed something else in Germany because a German bicycle company already had the name "Mustang" licenced. It was a weird name with numbers in it if i recall. @Greg - thanks for trolling a thread about old vehicles. I had a buddy with a Canso. Cool little hot rod. The Beaumont was also nice. I had a freind with one of those too. I remember the Mercury trucks the most as there used to be lots of them around. I routinely see a Mercury like the one in the 1st picture in the summer. I like to see old restored vehicles that the collectors are not afraid to drive. I used to see the occasional Fargo around. I loved the "Ram" hood ornament on the WW2 era trucks. Those old cars and trucks have way more character than new stuff. Pickups seem to have to managed to maintain a certain amount of individual identity. It seems that most new cars are just cookie cutter versions of each other. Styled in a wind tunnel limits your shape. I hope that the new MPG rules do not doom trucks to the same fate as cars. Lou the biggest troll on the planet made me do it. 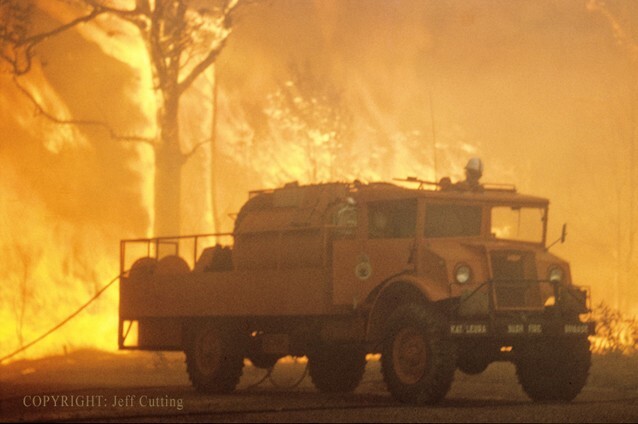 The most famous Canadian vehicle of all the "Blitz Wagon" used as a Bush Fire fighting up to the mid 1970's. @Robert Ryan - as always, great pictures. the "Blitz Wagon" looks like a WW2 era truck. I've actually seen a few around, but as flat deck (utility tray) trucks. It was a Canadian Chevrolet built for the then British Empire Forces in WW2. They were used as Rural Fire fighting vehicles and farm vehicles up the early 1970's. The 'Blitz Wagon' is actually a Canadian Military Pattern (CMP) truck. They were built by Ford Canada and Chevrolet Canada during WWII for the Commonwealth Forces. Fantastic little trucks, Ford and Chev actually collaborated on most of the body, frames and running gear to make them interchangeable. They had different engines and transmissions (Fords came with, depending on the size, one version or another of the Ford Flathead V8, and the Chevs came with the Chev Straight-6), but were mostly identical, so field repairs were pretty simple. 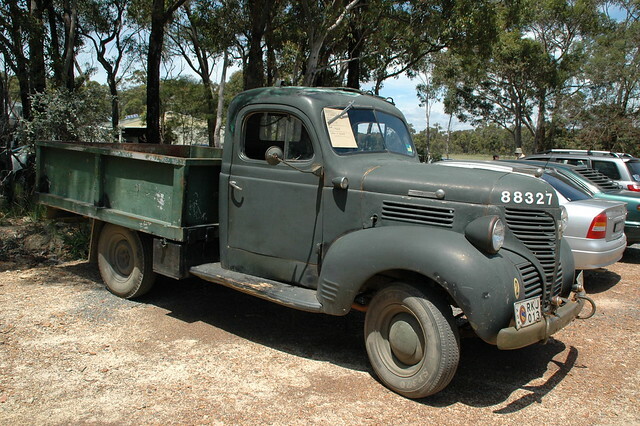 They were great little trucks, tougher, faster, more capable, more efficient and easier to repair than the CCKW that the US used, and they were used for everything, from prime movers to, with a bit of conversion, armoured cars. Came in 1/2-ton, 3/4-ton, 1.5-ton and 3-ton versions. After WWII, most of the ones overseas stayed there. There's a ton in the UK and a fair number in mainland Europe, and a decent amount floating around Canada and Australia, too. They're generally considered Canada's biggest and most important material contribution to the war effort, and they were used from 1939 onwards in WWII. I have heard of Mercury trucks and Plymouth trucks. Neat old trucks thanks for the pictures Mark. I agree @Lou the newer trucks don't have the same character and I fear like you that to meet the ever increasing MPGs trucks will become more like cars and will be indistinguishable from each other. Trucks and cars are more reliable and safer than they use to be but they also are more expensive and more complicated to work on. They are not as unique. My old IH was one of a kind but if I were driving on a long trip give me the new technology. I guess everything is a tradeoff. That's life. Just enjoy what you drive. Thanks Mark for the memories. Trying to find hub caps for a red and black 1950 mercury pick-up. Nice to see articles about these Mercury trucks but I sure got a laugh out of that comment about the spotters 'guide going up to '72 because it took a few years to sell off inventory after Oakville shut down.' First of all, the truck plant there didn't actually shut down til '94 and the Mercury truck production at both the Oakville and San Jose plants ended in the late spring of '68. The latest known built Merc so far has been documented with a Marti Report that shows a may 15/'68 build date. There's more information on the '67/'68 Mercs at this link: http://www.fordification.com/forum/viewtopic.php?f=2&t=35331. A friend of mine has a 1950 M-68 she wants to sell. It was her late husband's truck. Any idea where I should be listing it ? It is in very nice shape, not fancy, all original, and I have driven it. runs well. got it listed on Kijiji/saskatoon right now. Located on vancouver island. any help would be appreciated. Just wanted to recall the Pontiac Parisienne in Canada .It was a great car in my memory. The Americans only had the Bonneville. In 1962 I heard that Pontiacs outsold Chevrolets. The Acadian was not a Pontiac. It was sold by Pontiac dealers and had some Pontiac styling cues but it was an Acadian, not a Pontiac. Acadian and Beaumont were both separate marques.